First you must collect the dog's undercoat using a hand carder or a comb. This enables you to collect the thick fur next to the skin. The quality of yarn depends primarily on the quality of brushing. 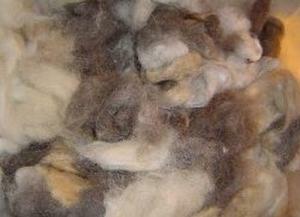 To obtain first quality wool, it is essentially to brush the dog's body and the chest. Do not brush it's tail or hind legs as te wool would be pickly. You must be careful not to put knots and burs and particularly avoid any plant remnants or other impurities, these will disintergrat on drying and it will be very difficult to remove them from the undercoat later on. Never brush or store damp undercoats. You can store your collection in a plastic bag, but not in a damp. Depending on the fat content, the various different procedures of carding, spinning and washing will cause a 10 to 20% loss off the finished weight. This result will give you an idea of the amount of wool that you will get in return compared to the amount you suplied. Once this is done you can send your undercoat by "colissimo" packed in a plastic bag in cardboard box. * The dog's breed and name (it's photo if you wish). When the balls of wool are ready, you are informed (by phone or mail) the exact weight of wool (to the nearest gram) and the corresponding price. Your parcel of Wool will be sent by return Colissimo. Now all you need do is take your knitting needles and knit a beautiful garment with wool from your companion. Except for white dogs, all other breeds are never single-colored. You will obtain a unique garment, with the natural color of your dog.